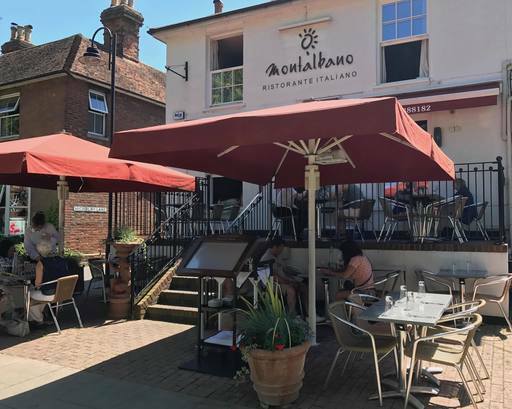 Montalbano is a family run restaurant born from our family’s passion and tradition for great food served in great company. The menu is a mix of regional Italian dishes with touches of the very southern part of Italy: Sicily. We aim to bring the warmth of the south of Italy and delight you with great traditional homemade flavours. Our Gelato cart is often seen around town and in the park (weather permitting) or outside our restaurant. Our Gelatiere (ice cream chef) creates new recipes to offer you an imaginative range of flavours to bring you that extra little touch of Italy here in the heart of Tenterden. The Bling Crosbies - Alain Du Sel and Ellie Laine - are a fun, sequin-clad duo singing classics from stars ranging from Frank Sinatra to Michael Buble, and from Nina Simone to Amy Winehouse…along with a few surprises. Alain is a classically-trained singer who performs with power, emotion and lashings of cheeky charm. He has sung at private parties for A-list Hollywood celebrities. Ellie, who also fronts jazz and blues bands, w as honoured to be one of the professional singers invited to sing alongside residents from the Grenfell Tower community on Simon Cowell's charity single Bridge Over Troubled Water, which was a No1 hit worldwide. Find out more at www.theblingcrosbies.co.uk Enjoy a fantastic evening with our 3-course set menu and live music, £29.95 per person Don't miss it ... our live music nights are always a hit! Who doesn't love ABBA.... so book early! Enjoy a fantastic evening with our 3-course set menu and live music, £35.00 per person Don't miss it ... our live music nights are always a hit! Enjoy a fantastic evening with our 3-course set menu and live music, £29.95 per person A mesmerising operatic performance by @ThomasinTreziseProfessionalOperaSinger Marvel at Thomasin's voice here https://www.youtube.com/watch?v=2XDg7HHUdEk Don't miss it ... our live music nights are always a hit! Enjoy a fantastic evening with our 3-course set menu and live music of Neapolitan + Swing + Rock'n'roll, £29.95 per person Salvatore is a pianist-composer- singer-songwriter originating from Naples, Italy. He has performed in Italy, France, Denmark and Switzerland. Salvatore is now permanently based in London where he is featured regularly by many of the Capital's finest Hotels, Restaurants and other live music venues. With his natural sense of rhythm, mixed with Classic, Latin and Italian influences, he provides a versatile repertoire which spans the old school swing - blues era, rock 'n' roll to more contemporary music. All executed with great energy and charisma. With his unique style he is one of the most frequently requested musicians in London. Discover Salvatore here http://www.salvatoredeconcilis.com/ Don't miss it ... our live music nights are always a hit! Paul performs hits by Frank Sinatra, Dean Martin, Robbie Williams, Ricky Martin and Freddie Mercury You can take a look at Paul's show here http://www.paulcantara.com/ Enjoy a fantastic evening with our 3-course set menu and live music, £29.95 per person Don't miss it ... our live music nights are always a hit!